■ IGENITY DNA indicates Steel Shot as a maternal powerhouse. ■ Calves on the ground and look great with good BW. ■ Exceptional red son of Steel Force. ■ Popular bull in the 2012 "The One" Sale in Denver. 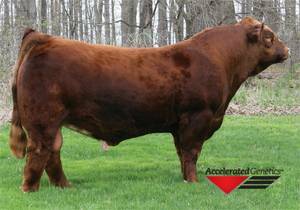 ■ From an exceptional cow family at Long Simmentals in Iowa. ■ Maternal brother to many champions and sale toppers.